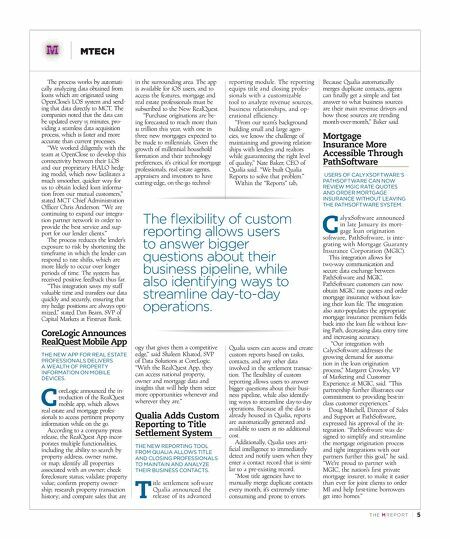 4 | TH E M R EP O RT MTECH Groups Voice Concerns Over OCC's FinTech Charter INDUSTRY GROUPS CALL FOR CONSISTENCY AND SPECIFICITY IN SUPERVISING FINTECHS OFFERING BANKING SERVICES. T he Office of the Comptrol- ler of the Currency (OCC)'s announcement in early December that it would grant a special purpose national bank charter to non-bank financial tech- nology companies (FinTechs) that offer banking products and ser- vices is causing no small amount of concern in the industry. The National Association of Federally-Insured Credit Unions (NAFCU) wrote a letter to the OCC in late January urging the agency to hold FinTechs to the same standards as banks when it comes to regulation and supervision. The Independent Community Bankers of America (ICBA) ex - pressed concern via a letter over the degree to which the OCC plans to regulate (or not regulate) FinTechs that choose the bank charter. "ICBA strongly supports respon - sible innovation and welcomes the OCC establishing a new Office of Innovation that could poten- tially help those community banks that are interested in partnering with…'FinTech' companies," ICBA wrote. "However, ICBA has strong concerns about issuing special purpose national bank charters to FinTech companies without spelling out clearly the supervision and regulation that these chartered institutions and their parent com - panies would be subject to." New York Department of Financial Services Superintendent Maria Vullo expressed similar sentiment in a comment letter to the OCC. "The OCC should not use technological advances as an excuse to attempt to usurp state laws that already regulate FinTech activities where they intersect with banking and lending, whether depository or nondepository," Vullo wrote in the letter. "New York is the leader of innovation and will continue to promote small businesses and leaders in this field. However, a one-size-fits-all federal charter will not work to create a level-playing field among all financial services companies, or to alleviate risks. On the contrary, the proposal increases risk, creates an opportunity for regulatory arbi - trage and attacks states sovereignty. New York will continue to protect our markets and consumers." A comment letter from the American Bankers' Association (ABA) indicated support of the decision to offer special national bank charters to FinTechs—as long as there is consistency in supervi - sion and regulation. "The ABA supports the initiative of the OCC to facili- tate financial innovation," wrote Rob Morgan, VP, Emerging Technologies with ABA. "ABA be- lieves that innovation in financial services continues to have tremen- dous potential to benefit customers as it has throughout the history of banking. Innovation can give customers improved transparency into the financial products they use every day, make it possible to extend credit to many more borrowers, and promote financial inclusion, giving greater access to financial services. These benefits are only realized when innovations are delivered responsibly. ABA supports the OCC's intent to con - sider special-purpose charter appli- cations from FinTech companies as long as existing rules and oversight are applied consistent with those for any national bank." FinTechs are not required to take advantage of the special purpose national bank charter the OCC has made available to them. Comptroller Thomas Curry said at the time of the announcement that the move was part of further - ing responsible innovation in the financial industry, and that charter was being offered to FinTechs in order to meet the changing financial needs of consumers by providing the "better, faster, more accessible products and services" that FinTechs potentially offer. OpenClose and MCT Integrate to Maximize Hedging THE COMPANIES WORKED TOGETHER TO STREAMLINE LOAN DATA DELIVERY THROUGH OPENCLOSE'S LOAN ORIGINATION SYSTEM. L oan origination system (LOS) provider Open- Close and mortgage hedge advisory and secondary market- ing technology firm Mortgage Capital Trading Inc. (MCT) announced the development of "an integration that eliminates manual intervention and stream - lines the delivery of loan data to maximize hedging for lenders," according to the two companies. 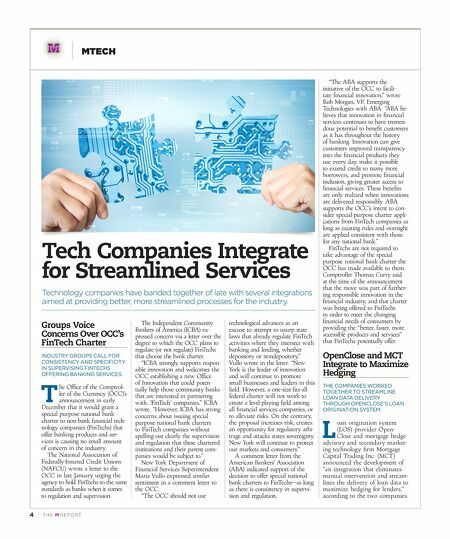 Tech Companies Integrate for Streamlined Services Technology companies have banded together of late with several integrations aimed at providing better, more streamlined processes for the industry.